Charlotte was the daughter of George Salisbury and Charlotte Burns. No further ancestry is known at this time. 1. 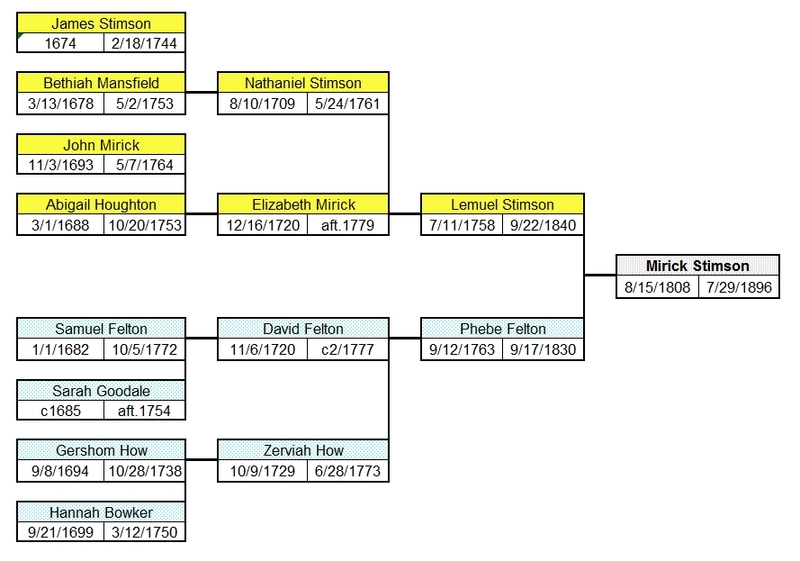 MIRICK6 STIMSON (LEMUEL5, NATHANIEL4, JAMES3, JONATHAN2 STIMPSON, JOHN1) was born 15 Aug 1808 in Ashburnham MA, and died 29 Jul 1896 in Fitchburg MA. 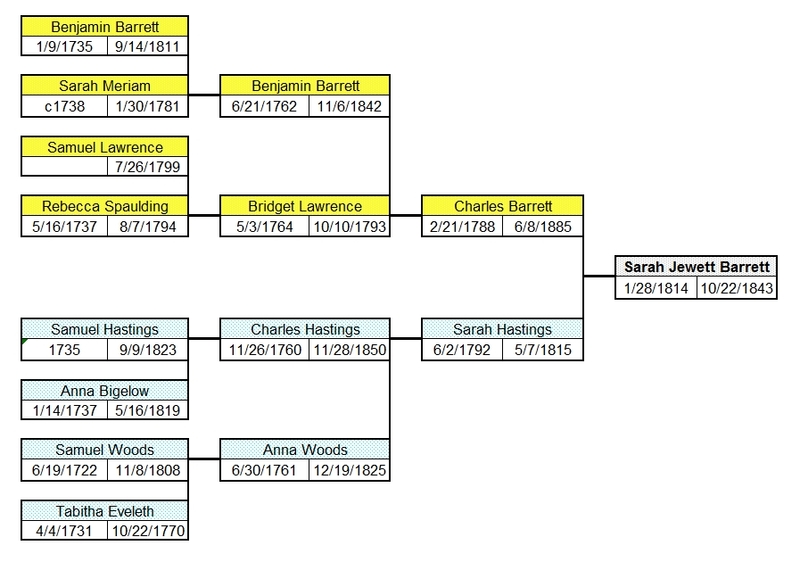 He married (1) SARAH JEWETT BARRETT 14 Sep 1834 in Ashburnham MA, daughter of CHARLES BARRETT. She was born 28 Jan 1814 in Ashburnham MA, and died 22 Oct 1843 in Gardner MA. He married (2) CHARLOTTE E D SALISBURY 17 Apr 1844 in Gardner MA. She was born 31 Jan 1821 in Lee MA, and died 24 May 1901 in Fitchburg MA. i. SARAH ELIZABETH7 STIMSON, b. 22 May 1835, Ashburnham MA; d. 19 Aug 1835, Ashburnham MA. ii. CHARLES STIMSON, b. 04 Sep 1837, Gardner MA; d. 19 Nov 1846, Ashburnham MA. 2. iii. SARAH DELIA7 STIMSON, b. 13 May 1845, Gardner MA; d. 06 Dec 1904, Fitchburg MA. 3. iv. CHARLES MIRICK STIMSON, b. 09 Sep 1847, Gardner MA; d. Aft. 1910. 4. v. FREDERICK SALISBURY STIMSON, b. 03 Jun 1853, Ashburnham MA; d. Aft. 1900. 2. SARAH DELIA7 STIMSON (MIRICK6, LEMUEL5, NATHANIEL4, JAMES3, JONATHAN2 STIMPSON, JOHN1) was born 13 May 1845 in Gardner MA, and died 06 Dec 1904 in Fitchburg MA. She married ARTHUR WELLS FIELD 19 Nov 1868 in Ashburnham MA. He was born 02 Oct 1846 in MA, and died Aft. 1920.
i. LOTTIE CELINDA8 FIELD, b. 18 Jul 1879, Leominster MA; d. Aft. 1900; m. IRA DIDWARE (DIDOIRE), 20 Jun 1900, Boston MA; b. Abt. 1869, Waterville Canada; d. Aft. 1900.
ii. LEON STIMPSON FIELD, b. 03 Jun 1883, Ashburnham/Chelsea MA; d. Aft. 1940; m. GEORGIA C BROWN, 30 Dec 1912, Fitchburg MA; b. Abt. 1884, Easthampton MA; d. Aft. 1940.
iii. HELEN ESTELLE FIELD, b. 30 Jul 1888, Fitchburg MA; d. Aft. 1910. 3. CHARLES MIRICK7 STIMSON (MIRICK6, LEMUEL5, NATHANIEL4, JAMES3, JONATHAN2 STIMPSON, JOHN1) was born 09 Sep 1847 in Gardner MA, and died Aft. 1910. He married FLORA M TUCKERMAN 13 Sep 1876 in Ashburnham MA, daughter of HENRY TUCKERMAN. She was born Abt. 1851 in MA, and died Aft. 1910.
i. EVA CHARLOTTE8 STIMSON, b. 17 Jul 1877, Leominster MA; d. 10 Jan 1890, Worcester MA. 4. FREDERICK SALISBURY7 STIMSON (MIRICK6, LEMUEL5, NATHANIEL4, JAMES3, JONATHAN2 STIMPSON, JOHN1) was born 03 Jun 1853 in Ashburnham MA, and died Aft. 1900. He married (1) ELLEN L DAVIS 25 Nov 1874 in Fitchburg MA. She was born Abt. 1856, and died Aft. 1876. He married (2) LAURA AGNES DODWELL 10 Nov 1881. She was born Abt. 1851, and died 02 Jun 1893 in MA. i. ERNEST FREDERICK8 STIMSON, b. 17 Nov 1876, Stoneham MA; d. Aft. 1897; m. SOPHIA A CARRON, 10 Aug 1897, Boston MA; b. Abt. 1876, Nahant MA; d. Aft. 1897. 5. ii. GEORGE MIRICK8 STIMSON, b. 03 Aug 1882, Azores; d. Aft. 1940.
iii. IRENE ELIZABETH STIMSON, b. 18 Mar 1886, Boston MA; d. Dec 1965, VT.
iv. AGNES FRANCES STIMSON, b. Nov 1892, Chelsea MA; d. 21 Sep 1902, Boston MA. v. WILLARD FRED STIMSON, b. Abt. 1893, Winthrop MA; d. 30 Nov 1893, MA. 5. GEORGE MIRICK8 STIMSON (FREDERICK SALISBURY7, MIRICK6, LEMUEL5, NATHANIEL4, JAMES3, JONATHAN2 STIMPSON, JOHN1) was born 03 Aug 1882 in Azores, and died Aft. 1940. He married RUTH WHITMAN 24 Dec 1912 in Winthrop MA. She was born Abt. 1884 in Boston MA, and died Aft. 1940.
i. RUTH WHITMAN9 STIMSON, b. 10 Oct 1914, Winthrop MA; d. 21 Apr 1990, Lyndon VT; m. FRANCIS LEWIS; b. Abt. 1906, NY; d. Aft. 1940.
ii. BARBARA STIMSON, b. Abt. 1920, MA; d. Aft. 1940.